The entertainment world lost a comedic legend this week, as celebrities, movie lovers and even President Obama mourned the death of Harold Ramis. But that's not all people were talking about. A new "Godzilla" trailer was unleashed, as was a new season of "Survivor," Robin Thicke and Paula Patton split and Paul Rudd emerged victorious over Jimmy Fallon in a "Tonight Show" lip-sync battle. A bevy of stars paid tribute to Ramis, 69, who co-wrote and starred in "Ghostbusters," co-wrote "National Lampoon's Animal House" and directed films like "Caddyshack," "Groundhog Day" and "Analyze This." Ramis' "Ghostbusters" co-star Dan Aykroyd was among those who honored Ramis' life and legacy, calling him "my brilliant, gifted, funny friend, co-writer/performer and teacher." De Lucia, one of the world's greatest guitarists, died in Mexico on Wednesday at the age of 66, officials said Wednesday, after suffering a heart attack while on vacation. His death was mourned by musicians like fellow guitarist Slash, who called him "of the most phenomenal [guitarists] I've ever seen play." Juan Pablo Galavias narrowed his prospects down to four women -- Nikki, Claire, Andi and Renee -- and went to visit each of their hometowns and meet their families this week on the first of two "Bachelor" episodes. Sweet single mom Renee was sent packing, and there was a major dose of drama during the following night's episode when the group went to St. Lucia and Andi quit the show after what she called a "nightmare" evening in the Fantasy Suite. According to her, Juan Pablo never asked her anything about herself during their night together, name dropped and talked over her, said she was there by "default" and told her about his overnight date with Claire. The "Blurred Lines" singer and his actress wife made headlines when they announced they had separated after nine years of marriage. The couple, who met when they were teenagers, have a 3-year-old son. Thicke took to Facebook this week to thank fans for their support and told the crowd during one of his concerts, "I'm just trying to get my girl back." In an interview with People, Dean said she identified with Sam, the NFL's first openly gay prospect. "I feel like 'embattled' or 'disgraced' will always follow my name. It's like that black football player who recently came out," she told the magazine. "He said, 'I just want to be known as a football player. I don't want to be known as a gay football player.' I know exactly what he's saying." Fans of the Gabrielle Union-starring drama "Being Mary Jane" got to see the show's two-hour season finale on Tuesday night, when the Union's talk-show host character, Mary Jane Paul, decided to right the wrongs of all the people she's hurt. That's not the last viewers will see of her, though -- the show's already been renewed for a second season. 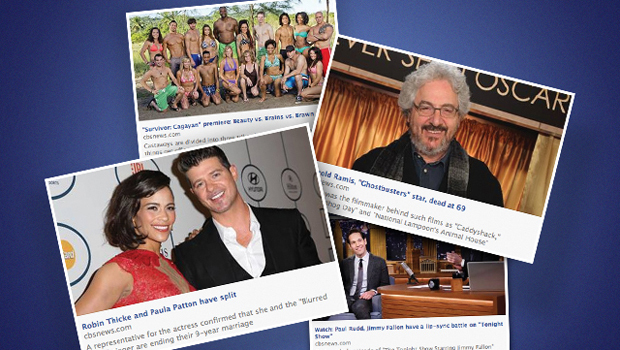 *Buzz rankings reflect the top entertainment topics being discussed on Facebook, Feb 23-26, in the United States. Rankings are based on both frequency and momentum: the Facebook conversations that not only got a lot of buzz during the week, but also saw a notable increase compared with the previous week. Tell us: What stories were you buzzing about this week?